Auroville Language LaboratoryALL : 20-03-2017 to 19-05-2017 : Auroville International Zone. 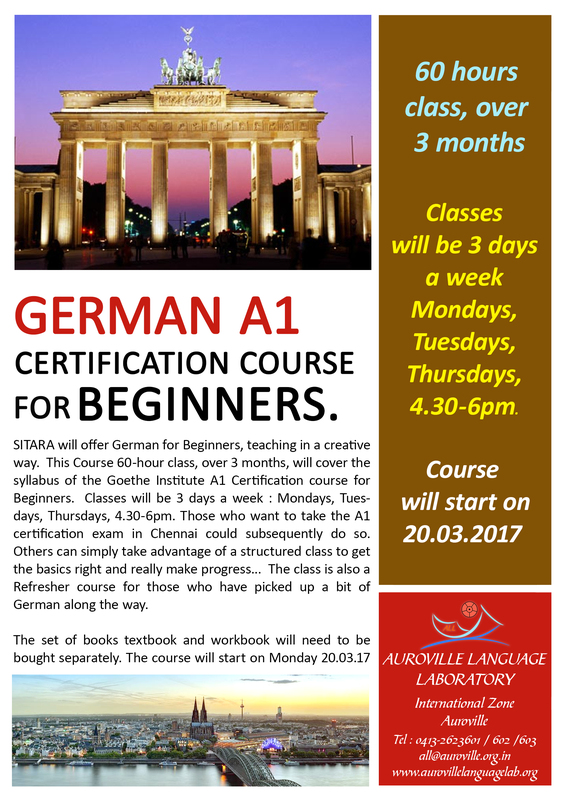 SITARA will offer German for Beginners, teaching in a creative way. This Course will cover the syllabus of the Goethe Institute Al Certification course for Beginners. Those who want to take the Al certification exam in Chennai could subsequently do so. Others can simply take advantage of a structured class to get the basics right and really make progress...The class is also a Refresher course for those who have picked up a bit of German along the way. The set of books (textbook and workbook) will need to be bought separately. The course will start on Monday 20.03.17 and go till 30.05.2017. Extra hours to cover the syllabus will be arranged if necessary.